The provincial government of Maguindanao will launch the first “Inaul Festival” this February 9-14 in Buluan. 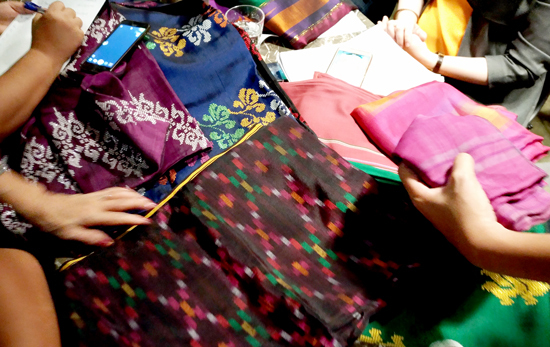 This festival will highlight and re-introduce to the market, both local and international, a time-honoured, hand-woven fabric that designers, fashion enthusiasts love not only because of its intricate patterns, radiant and deep colours but also because of its rich cultural history. 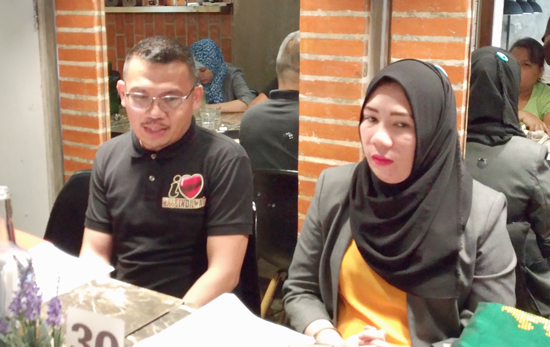 In an intimate gathering of lifestyle/travel bloggers and media friends at Coffee Grounds in Davao, DP Ampatuan, the Festival Director revealed that this all-out promotion of the festival is a way to alleviate people’s perception of the province persistently heard to have unstable peace and order situation. He said further that this festival will hope to lessen the negative notions and at the same time promote that there are more beautiful things happening in the province than what we usually read and hear. at Coffee Grounds during the media briefing. 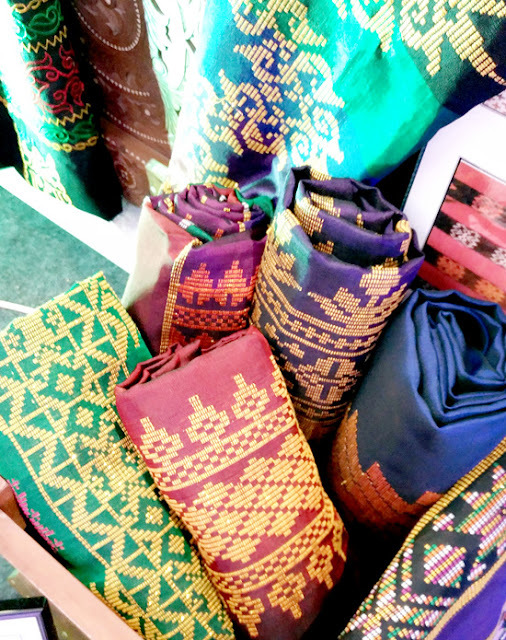 INAUL is a Maguindanao word meaning ‘weaved’. This historic weaving is mainly done by Maguindanao women. The fabric is traditionally used as ‘malong’. It is also considered as ‘Bara-Bangsa” a term identical to royalty, dignity and nobility. Wearing Inaul in the past was a status symbol and was worn always with pride and respect. Aside from Inaul’s intricate designs, I adore the colours. Besides them deep and rich they represent the vibrant culture of Maguindanao. Each of the colours used in weaving corresponds to a particular meaning. The yellow and orange stand for royalty; while red represents bravery. White speaks purity, grief and mourning. Green indicates peace and harmony. Black signifies nobility and dignity. Today, Inaul is no longer confined to just ‘malong’ and other traditional garments. These hand-made masterpieces have caught the attention of many renowned fashion icons in the country and have transformed the remarkable fabric into a world-class and celebrated work of art. 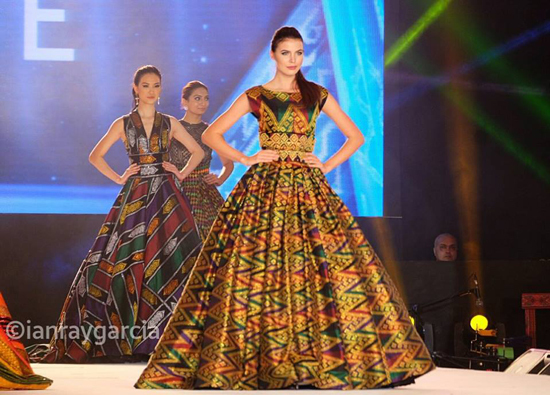 The Miss Universe Mindanao Tapestry Fashion Show that was held on January 18 at SMX Convention Center in Davao City was a historic proof as Inaul took world centerstage with the candidates of Miss Universe showcasing Inaul fabric made into glamorous and enchanting ballgowns. 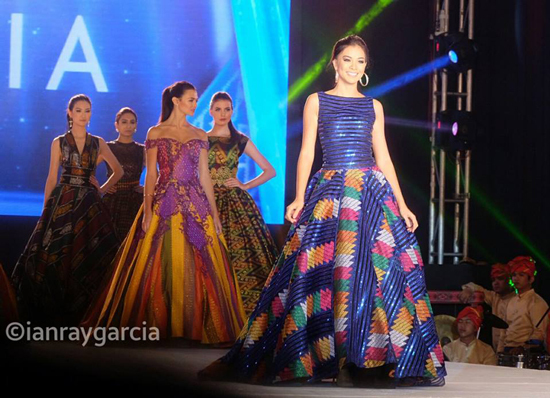 Miss Universe candidate in Inaul Ballgown. 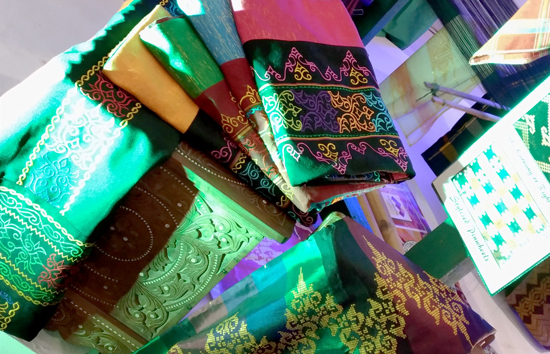 With Inaul in the spotlight right now, the Autonomous Region in Muslim Mindanao gives honour to this regal fabric of Maguindanao, along with its women weavers who conscientiously and devotedly create them, by celebrating this first Inaul Festival. The rising demand of Inaul fabric has intensified the efforts of the provincial government to conduct regular monthly 15-day weaving training for new women weavers. At the moment there are 2 weaving private production centers in Maguindanao each with at least 60 weavers. 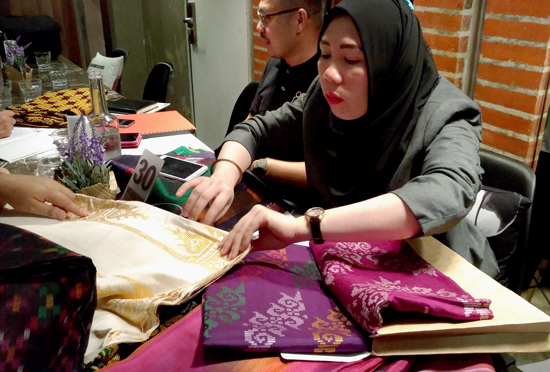 They are also working to put up seven more weaving centers to meet the market demands especially that many Manila and local companies and designers signify their intent to order in bulk. The Department of Tourism-ARMM, headed by Secretary Ayesha Dilangalen commit and support this program, not only in helping the many women in Maguindanao make a living but to help preserve, protect, and sustain this exquisite intangible cultural heritage of Maguindanao. Let’s wear and celebrate our culture with pride!